Mary sponsors Mosaic Monday each week and from time to time I like to play! This mosaic is of the snowmen found in our neighborhood after a heavy snow on Friday! Your friends are so cool! ** What a cute picture of you, Terri! I agree Terri, your picture is cute as can be. Lovely mosaic. Enjoy your week. I'm so JEALOUS! I love snow and even tho we're blasting hot and cold here, I still long for a snowfall! Love the pictures, love them! Hope you are feeling well, Terri! We are getting another foot or so tonight. Thank goodness it is pretty or it would be downright miserable. Your neighborhood snowmen are so cheery. I'll be praying for you tonight and tomorrow and the week to come. I hope your surgery tomorrow goes quickly and smoothly. 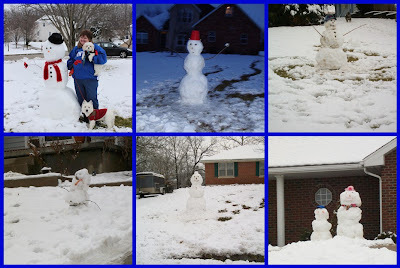 Love your snowman, Terri! That first photo upper left is so cute! Have you on my heart....and I am lifting you up! Those are nice big snowmen! We don't usually get enough snow to make a normal sized one! But tomorrow we're supposed to get a couple of inches so we'll see.